Bassist Steve Horowitz is a busy musician and composer, working on television shows for Nickelodeon, movies ("Super Size Me") and performs in numerous groups. 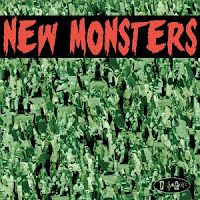 For "New Monsters" (Posi-Tone Records), he's assembled a quintet from the San Francisco Bay Area to play music composed by tenor saxophonist Dan Plonsey. The other lead voice is Steve Adams (alto and soprano saxophones, flute) from ROVA Saxophone Quartet. Rounding out the group is Jim Bove (drums) and Scott Looney (piano). The latter is a veteran of the "New Music" scene in San Francisco, having worked with saxophonist Jon Raskin (also from ROVA), Oliver Lake, and guitarist Henry Kaiser. This is certainly one of the more sonically challenging Posi-Tone releases. There's the sweet blend of the reeds on just about every track while Looney plucks inside his piano to create a percussive change-of-pace on thbe bouncy "Vision Pyramid Collapse". He goes right back inside on the next track, "Miracle Melancholy", a fascinating work that's shows the influence of Japanese folk music. Horowitz's expressive electric bass work meshes well with Bove's creative percussion. The one non-Plonsey composition is a clever mash-up of John Coltrane's "India" with Eric Dolphy's "The Red Planet" - both Adams and Plonsey take exciting solos, egged on by the active rhythm section, while Looney stays outside the piano for his solo. There are plenty of creative twists-and-turns in this program. The circular melody line of "New Boots For Bigfoot" opens up for strong solo statements from Looney and Horowitz (a very thoughtful meditation) and the interwoven lines of Plonsey and Adams (on flute). The sprightly played piano and drum dialogue, "Brains for Breakfast", leads right into the crazy-bop of "Herald of Zombies", with quasi-march opening that gives way to a hellacious alto saxophone solo followed by an equally crazy tenor solo over Looney's "Charles Ives meets Barrelhouse" piano spotlight. The playfulness continues on the final track, "Cylinder", with its '60s "pop" music beat and dueling saxophones. 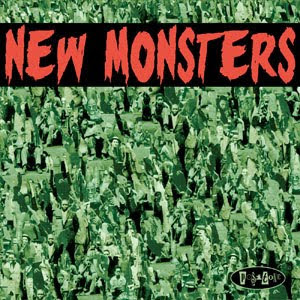 "New Monsters" is playful yet edgy music that ought to bring a smile to listeners who like to be challenged. The proceedings often has the feeling of the Willem Breuker Kollektief sparring with The Mothers of Invention while Fred Ho throws in his 2 cents worth; this is music that pokes one in the eye while making his feet tap. What a treat! For more information, go to www.posi-tone.com. Saxophonist Doug Webb calls his new CD "Swing Shift" - it's his 3rd for Posi-Tone Records, all recorded with the same rhythm section (bassist Stanley Clarke and drummer Gerry Gibbs) and 3 separate pianists (Larry Goldings, Joe Bagg or Mahesh Balasooriya.) Chances are quite good that these songs were recorded in the same marathon session that produced his previous Posi-Tone releases. Webb plays soprano sax on 2 tracks, alto sax on 1 and tenor on the remaining 3. The 22-minute + "Patagonia Suite" is a fiery work, with Webb's soprano soaring over Clarke's muscular acoustic bass lines, Gibbs' hearty drumming, and Balasooriya's pounding and hypnotic piano chords. After a furious exchange with the rhythm section, Webb switches to tenor for a long, hard-edged, solo. Balasooriya; who's in his early 20s, also offers strong support on the lovely version of Frank Foster's "Simone", the track that features Webb's best work on soprano (it's the best realized piece on the disk). The leader switches to alto sax for "Where Or When", a duet with Joe Bagg, who shows an inventive touch on the piano with a touch of stride in his approach. "Rizone" is also a duo piece, this time a blazing tenor solo over Gibbs' driving drums. Goldings appears on the fairly straight-ahead reading of Mal Waldron's "Soul Eyes", his fleet fingers producing a fine solo. "Swing Shift" has its good moments but suffers from uneven sound. Several tracks feature too much echo on the saxophone or the bass is too prominent in the mix. There are also times when Webb, who is a solid musician, overplays or runs out of ideas. He'd be better served taking a quartet into a club for a week and recording live. For more information, go to www.dougwebb.us. The moody ballad "November Twilight" (originally recorded by Ms. London in 1956) is quite pretty with fine bass work from Axt (who works with Tierney Sutton) and handsome piano work from Hendelman. Dechter's bluesy licks enliven Henry Mancini's aptly-titled "Free and Easy" while his gentle chording adds a bossa-nova lilt to "Where Are You". "To The Ladies of Cool" simmers and shimmers, swings and soothes - like the 4 women she celebrates, Kathy Kosins is not a demonstrative vocalist. Her delivery is even-keeled, her voice emotional but not overly so, nor she exhibit the desire to fill out the songs with unnecessary vocal sounds. Instead, she's the singer in front of an impressive ensemble performing a fine program of good songs. Give this a serious listen - to find out more, go to ladiesofcool.com. Listen Closely, This Music Speaks!